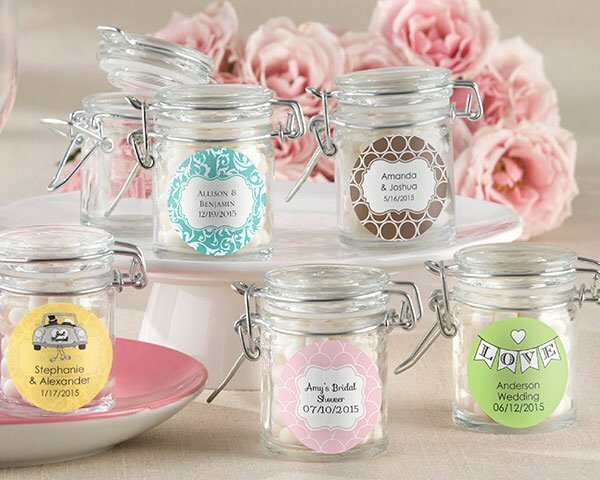 Just like the classic canning jars with a hinged lid, these cute little wedding favor jars will hold a special treat. Fill with candies, bath salts, decorative sand or other trinket, these jars will form a tight seal and have your guests smiling with delight! The perfect finishing touch for each jar is an optional custom sticker that you can attach to the front. Select your favorite color and background theme, then add your names and wedding date for the perfect take-home gift. Jars measure 1 3/4" by 2 1/2" (with the lid closed). Holds nearly 4 ounces (approximately 40 pieces of small candy). Sold in a set of 12. 2 Sets required for purchase. I'm looking at the kate aspen favor jars and I see they come in sets of 12, correct? 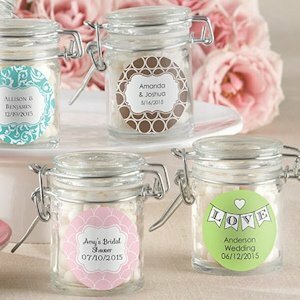 Yes, the Personalized Glass Wedding Favor Jars are sold in a sets of 12 and 2 Sets are required every purchase.